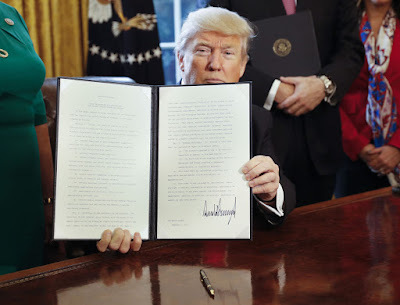 Today’s post reacts to the recent report put forward by the U.S. Department of the Treasury entitled ‘A Financial System That Creates Economic Opportunities: Banks and Credit Unions’, which represents the aim of the Trump Administration to ‘do a big number on Dodd-Frank’. The headline effect of the report, namely the proposed circumvention of the Consumer Financial Protection Bureau (CFPB) on the basis that ‘the CFPB’s approach to enforcement and rulemaking has hindered consumer choice and access to credit, limited innovation, and imposed undue compliance burdens’, will no doubt be the key issue with regards to the fallout of this contentious report. For this post, we will assess the report and the underlying sentiment, and then position this understanding within a wider picture of the ‘amnesia’ that is taking hold despite a number of globalised warnings regarding the ability of the system to withstand any more shocks so close to the last Crisis. The Treasury report is the first of a number of reports that are due in the coming years. The reports are important because we can see, in black and white rather than on Twitter, just how President Trump envisages the financial system and how it should operate. With that in mind, the opening gambit of the report is telling. The approach of the Treasury, now controlled by Steven Mnuchin who we have covered previously here in Financial Regulation Matters, is attached to what they are calling the ‘Core Principles’ which, derived from an Executive Order, range from ‘Empower[ing] Americans to make independent financial decisions and informed choices in the marketplace’, to making ‘regulation efficient, effective, and appropriately tailored’. In this specific report, the focus is on Banks and Credit Unions, with the underlying sentiments focused on ‘breaking the cycle of low economic growth’ and ‘better fulfilling the credit needs of consumers and businesses’, predominantly. With regards to ‘economic growth’, the report is forthright in its focus on the decontextualised understanding that ‘the U.S. economy has experienced the slowest economic recovery of the post-war period’ – the report is clearly downplaying what the Economy is actually recovering from, as there is nothing to compare it to in the ‘post-war’ period. On this basis, the report singles out the Dodd-Frank Act and its ensuing regulations, stating that ‘the sweeping scope of and excess costs imposed by Dodd-Frank’… have resulted in a slow rate of bank asset and loan growth’, and that the regulations ‘created a new set of obstacles to the recovery’. This recovery, according to the report, can only be realised by a prosperous banking sector and ‘an extension of credit to consumers’, which brings us to the second component of the report. With regards to credit, the report states that ‘the largest stalled asset class is residential mortgage lending’, which is supposedly due to the ‘lack of tailoring and imprecise calibration in both capital and liquidity standards’. In relation to this, there was an extensive focus on the issue of costs emanating from compliance, with it being advanced that ‘increased oversight and regulation has led to an increase in compliance costs’. Residential mortgages, a market which was dogged by systemic fraud, is an important aspect for the report, with the overriding sentiment being that there needs to be a ‘careful study of regulations and the extent to which they may be holding back the supply of mortgage credit’ which is obviously music to the ears of the financial sector – the Financial Services Roundtable gleefully declared that ‘today’s report is an important step towards modernising America’s financial regulatory system’. Yet, whilst the financial lobbyists prepare for their celebrations, there are a number of extremely important, and extremely worrying developments that emanate from the report. The first is an issue that is currently on the lips of regulators in the U.K.: capital requirements. Yesterday, and pre-empting tomorrow’s post in Financial Regulation Matters somewhat, the Bank of England increased the capital requirements of Banks in the U.K. because of fears regarding excess lending – more specifically, fears remain over the easy access to credit for those who are not in a position to repay given potential shocks to the marketplace, something which we have discussed in Financial Regulation Matters with regards to the ever-growing auto-loan bubble. Yet, the Treasury’s report states that only ‘internationally active’ banks should be subject to capital requirements (a move aimed to unleash the speculative capacity of national institutions), and that for those ‘internationally active’ banks there should be a more rigorous test, like taking into account the ‘banking organisation’s historical experience’, as opposed to any more qualitative or quantitative measures. In opposition to the fears in the U.K. and around the world, like in China for example, the Treasury is adamant that Americans need access to more credit, not less, and the only way to do so is to fundamentally incapacitate the CFPB who, according to the report, hinders consumer access to credit. In order to achieve this end, the report suggests that the Director of the CFPB should removable at the will of the President, or alternatively be restructured as an independent multi-member commission (which could then be gutted from the inside out), funding the CFPB through an annual process (killing the Bureau by denying it oxygen i.e. funding), and incredibly ‘curbing abuses in investigation’, whatever that may be. This aspect, as suggested in the media, is unlikely to go down well with Elizabeth Warren, the Senator for Massachusetts, a leading voice in the creation of the CFPB, and a vocal critic of President Trump. The report details a number of proposals, but these headline-grabbing suggestions offer more than enough for us to understanding the sentiment of the rhetoric. The Trump Administration is, in no uncertain terms, readying itself for a major assault on the safety of American consumers, and global citizens moreover. The blatant rejection of global fears regarding the consumer-credit bubble that is growing, when considered in relation to the fact that the last crisis was only 10 years ago, is not only irresponsible, it is dangerous. The blinded rhetoric that looks at ‘growth’ independently of the reasons for the lack of it, are nothing short of a confirmation that history will judge this phase of American politics with damnation. The Executive Director of ‘Americans for Financial Reform’ responded to the report by stating that ‘the financial crisis had devastating costs for families and communities’ and that ‘we need more effective regulation and enforcement, not rollbacks driven by Wall Street and predatory lenders’, which is not only accurate, but perhaps even an understatement. What is clear, however, is that when Donald Trump repeatedly stated ‘America First’ during his campaign trail, he was misunderstood; he was referring to the American elite, not the American people – this report is the first of many that articulate that reality. 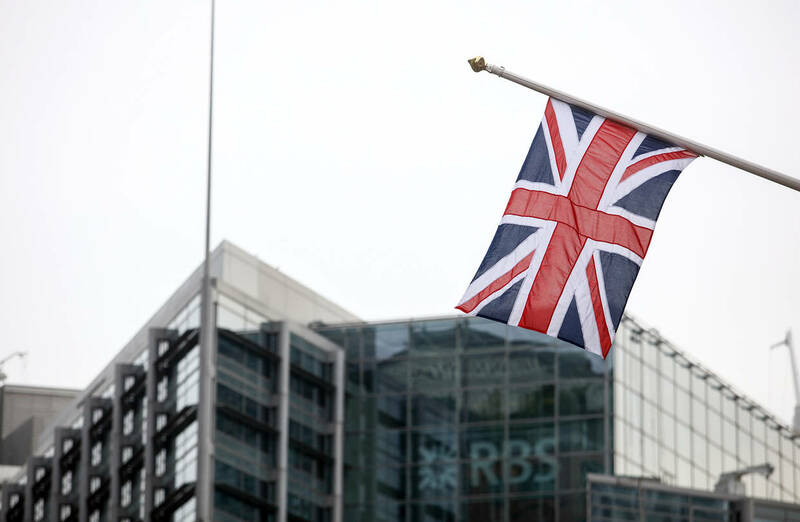 RBS and Its Bailout: Does The Bank Owe Loyalty to Britain? On many occasions here in Financial Regulation Matters we have looked at the troubled bank RBS, whether in relation to its continued malaise since it was bailed out by the British taxpayer, or whether in relation to the potential court cases that were threatened with regard to the Financial Crisis. With all this in mind, it is not hard to see why the recent news that the Bank is to cut 443 jobs and move the respective teams to India instead is causing quite a stir. So, in this post the focus will be on this outsourcing and the subsequent debate, but also whether bailing out a troubled bank should be the foundation to enforcing loyalty to the given country, as a number of people are suggesting in the wake of RBS’s recent declaration. The particulars of the RBS bailout in 2008 will not be repeated here, but the headlines of a £45 billion bailout and combined losses of £58 billion since tell the story clearly enough. It is against this background that the recent news emanating from RBS is causing such consternation; it was announced towards the end of last week that, as part of its restructuring, the bank would be moving 443 jobs in the division that arranges loans to small business to India, where it has a growing presence which now stands at around 12,500 people. The bank claims that the redeployment is due to it now being a ‘simpler, smaller, bank’, whilst it would offer assistance to affected staff by moving them into other divisions where possible. However, the Unite Union has been quick to lambast this move, making its position quite clear when it stated that ‘RBS will be getting that work done more cheaply at the cost of jobs and livelihoods here in the U.K.’, with the Chairman of the Federal of Small Businesses adding that the move was the ‘wrong way to rebuild trust’; considering this news comes on the back of news in May that the bank would be moving 250 I.T. jobs in the same direction, the issue of trust is clearly an important one to consider. However, should it really be the case that being in receipt of taxpayer funds binds you to that country? Putting the extremely important issue of the Bank’s strained relationship with small and medium businesses aside for one moment, the issue of the effect of a bailout is just as important. The national officer for finance at Unite stated that the move to outsource is ‘interesting for an organisation that owes its existence to the British taxpayer. We feel RBS has a moral responsibility to try wherever possible to keep work here in the U.K.’, a sentiment which moves the debate into much more ideological, and murkier waters. This notion of morality raises important questions about what the purpose of a bailout is: on the one hand, the aim is to prevent crisis but have the taxpayer’s money returned as soon as practicably possible; on the other hand, that assistance comes with the expectation that the private institution will be more sympathetic to the plight of the host country. In reality, well in 2017 at least, the former holds true – the neo-liberal sentiment is to break out the champagne whenever an entity is returned to private hands, like the situation with Lloyds Bank recently. Yet, this viewpoint does not consider the losses suffered by the taxpayer during the period of public ownership – the savage cuts that seriously affect most people’s way of life – which ties into the viewpoint of the Unite officer. So, it seems we are stuck in an ideological dichotomy whereby the faster return to private hands puts money back into the public fisc, whilst the methods used to achieve that goal actively affect the citizens who have had their way of life affected to provide the assistance in the first place. This ideological dichotomy is academic, really, because neo-liberalism is alive and well and the notion of a private institution doing anything to promote the social advancement of any nation is almost alien in this day and age, so they question then is why is the move by RBS even surprising? If, and that is a gigantic ‘if’ RBS ever return to the private ownership, there will be declarations by the Right that the marketplace has triumphed, but this in itself is an interesting notion. For some reason, the pro-market stance is getting stronger despite the obvious evidence in front of us every day that the market cannot be trusted to maintain itself – we live in a world where the market is cherished, and state intervention is ridiculed, even though the market continuously flirts with obliteration until the state intervenes (the recent news from Italy testifies to this) – this abhorrent attack on the public cannot continue at this pace. Irrespective of the health of RBS, experiencing cuts to welfare, public services, and other key components of the national health, just to see the very people responsible inflict further misery in the name of their own advancement, represents the nature of the neo-liberal approach. Although the recent elections in the U.S. and the U.K. do not support this following notion, it is surely the case that history will judge this era in a particularly damning light; RBS represents the pinnacle of what must be changed if society is to advance in any decent and humanist way. At the beginning of the month, we discussed here in Financial Regulation Matters the state-backed rescue of the world’s oldest bank – Monte dei Paschi di Siena (BMPS) – and what it may have meant for the issue of ‘too-big-to-fail’. Over the past weekend, news emerged from Italy that confirmed that the deterioration of BMPS was, as had been predicted, only the start of the troubling financial environment that is enveloping Italy at the moment. 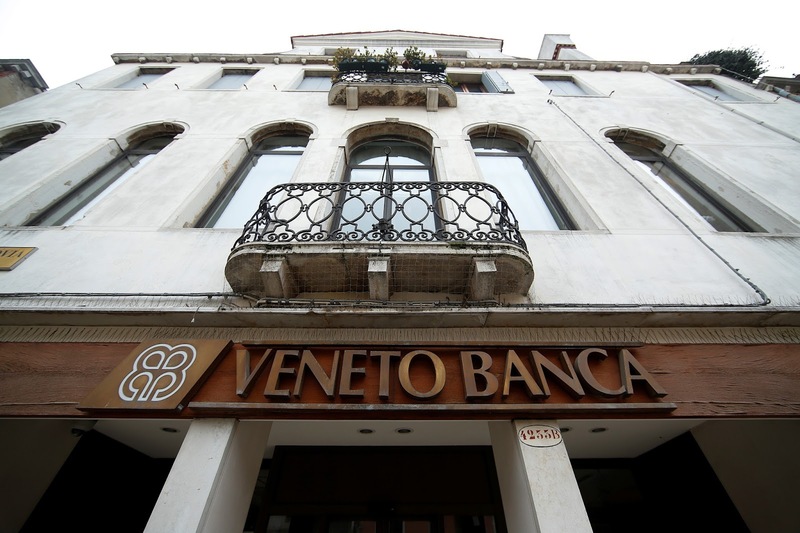 With the Italian Government receiving the support from the European Commission to provide financial assistance to two Venetian banks – Banca Popolare di Vicenza and Veneto Banca – the Government duly ‘bailed-out’ the two banks to the tune of €5.2 billion, with additional guarantees of €12 billion being put in place. In this post we shall therefore assess these recent developments, but then it will be important to ask what this means for the role, better yet the belief in financial regulation as an ideal – if the financial elite are conscious of the fact the institutions they represent will be ‘bailed-out’ with taxpayer money in times of crisis, what really prevents them from taking excessive risks? With the noticeable lack of punishment after the financial crisis bail-outs, the new millennium is seemingly being defined by a systemic lack of deterrent which, potentially, means that news like that emanating from Italy may be the new normal, or perhaps it has been that way for a while. The biggest fear for Banking regulators and politicians is a ‘run’ on a bank, which essentially denotes the collective panic to withdraw funds from a failing bank. It was for this reason, predominantly, that Italian banking ministers took action on Sunday to wind-down the two banks in question, with the process entailing the banks being split up into ‘good’ and ‘bad’ banks – in terms of assets – with the good assets being acquired by the largest retail bank in Italy, Intesa Sanpaolo, which as part of the deal also saw the Government provide €5 billion to Intesa. As for the ‘bad’ components, the Government will foot that particular bill to the tune of €12 billion, which takes the bail-out to a likely total of €17 billion as it is assumed the quantification of the amount of ‘bad’ loans controlled by the banks is accurate. The move to dissolve the banks came after an announcement on Friday from the European Central Bank that the two lenders were ‘failing, or likely to fail’, which allowed the Government to bring an end to attempts to resolve this issue privately and circumvent the supposed viewpoint of the European Union: ‘taxpayers are no longer meant to stump the cost to rescue a failing bank’. The government’s response was staunch, with the Economy Minister stating ‘those who criticise us should say what a better alternative would have been. I can’t see it’, with the European Commission’s Competition Commissioner supporting the action, ultimately suggesting that the provision of state aid would ‘avoid an economic disturbance in the Veneto region’. Whilst this may be the case, some of the details will be extremely disheartening for the Italian taxpayer. 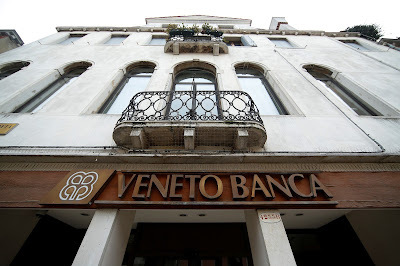 The first point to mention is that it is predicted that even though the ‘good’ components of the banks are being transferred to Intesa, along with €5 billion, there could be up to 4,000 job losses and the closure of many branches is a distinct possibility. Also, it will provide no comfort for the taxpayers footing the bill that senior bondholders have been protected from suffering losses, with those bonds being transferred to Intesa as part of the deal – the Government were able to skirt the rules imposed by the E.U. – that investors pay the penalty for bank failures, not taxpayers – by invoking a ‘public interest’ clause that argues the bank failures would have ‘wrecked’ the economy in the region. To perhaps rub salt in the wounds, the news at the time of writing is that the value of the bonds are soaring on the back of this governmental protection, which is unlikely to reduce the amount of criticism towards the situation. German Politicians have been quick to show their displeasure – given their status within the Union – with MEP Markus Ferber declaring that ‘with this decision, the European Commission accompanies the banking union to its deathbed’ and that ‘the promise that the taxpayer will not stand in to rescue failing banks any more is broken for good’. This point is crucial, as the situation is continually developing. News has just broken that the recapitalisation of BMPS has just been formally completed, which comes after news that the large Italian lender UniCredit is also experiencing problems which have seen it tap the marketplace for financing on three separate occasions since the Crisis. The recent rescue of the Spanish bank Banco Popular saw junior bondholders and shareholders suffer losses instead of the taxpayer, but the Italian taxpayers have not been so lucky this time. Yet, whilst the news is bad for the Italian taxpayer, it is even worse in the grand scheme of things. The proclamations stemming from the E.U. regarding the end to taxpayer bailouts has been proven to be false, which hints at a much bigger issue. The appropriation of the ‘public interest’ defence means that banks can and will be rescued, despite any political rhetoric to the contrary. The news that the major U.S. banks have passed the first phase of their annual stress testing, in spite of some worrying news, arguably means very little in the modern environment because, unfortunately, the Financial Crisis produced an extremely anti-social precedent: the taxpayer will be forced to rescue a filing bank, particularly if its interconnectedness is such that its failure would have systemic effects. Whilst many would presume this to be just i.e. a banking crisis could affect our way of life, what does it mean for the ‘balance’ within society? At the moment, there is very little deterrent for the leaders of a banking institution to act responsibly: will they be imprisoned for their negligence? No. Will the institution they represent perish as a result? No. Will they be allowed to keep all of their bonuses which were tied to short-term targets? Yes. There will be those that read this and will argue that things have changed, that regulation has made a repeat of the Financial Crisis impossible. There will be those that read this and will argue that there is plenty of deterrent and that these banks represent a tiny minority. Whatever merit those viewpoints have is irrelevant when we look at the amount of money being taken from the pockets of taxpayers to supplement these grand games of finance. Whilst it is suggested here that the pendulum has already swung, any more crises in the near-future will cement this lack of deterrent and confirm that the public will always pay the price for private failures; financial regulation and financial penalties are thus obsolete in the battle against venality and negligence in the financial sector – only extensive prison sentences, in real prisons, can stem this particularly awful tide. This short post today looks at the news that the rating oligopoly – the three largest agencies; Standard & Poor’s, Moody’s, and Fitch Ratings – has took aim at the Banking sector in Australia. The noises coming from Australia in response are the same noises we hear again and again when the rating agencies turn their collective focus towards a specific sector or a specific region, namely that the ratings downgrade will ‘do little to alter [the] costs of funding’. Yet, there is a much bigger issue, and that is that the cost of borrowing is not the most important aspect, rather the biggest issue is the safety net that the agencies and institutions recognise as being the new norm – taxpayer assistance. In this post, we will look at the current situation in Australia but we will also move back to look at the pattern that keeps emerging: a sector does not perform as ‘experts’ predict that it should, rating agencies collectively smell blood in the water and drop credit ratings, which becomes a self-fulfilling prophecy, and finally the taxpayer of that given region must suffer the consequences – then the agencies move elsewhere looking for blood in the water; this seems to be more of a ‘plague’ than a financial service. Recently, S&P cut the ratings of 23 small Australian banks, citing the growing risk of a sharp correction in property prices as the underlying factor in its decision. 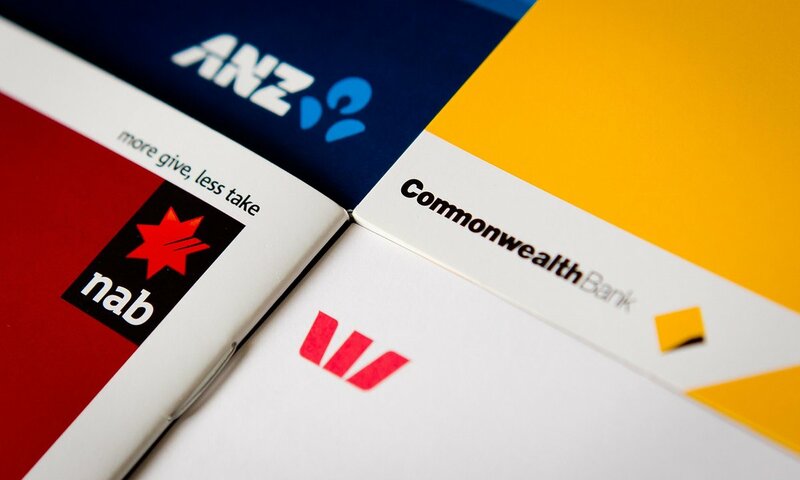 However, the agency stated that it would not change the ratings on the top four Australian banks – ANZ, Commonwealth Bank, National Australia Bank, and Westpac – on expectations that ‘the Australian government would support them if needed’. Yet, two days ago the other dominant force in the rating oligopoly, Moody’s, downgraded the long-term ratings of the Big Four banks, this time citing a rise on household debt and slowing wage growth as the leading factors in its decision. On the one hand, the agencies are zeroing in on a sector that has been coming in for criticism regarding its lending practices – which ultimately led to increased regulation – and is also the subject of a controversial bank levy, one which will see the big four banks and the Macquarie group (who we know from a previous post) subject to a $6.2 billion charge over a number of years. Yet, the banks, and a number of external analysts, are keen to argue that the downgrades will not have any effect, or very little at most, on their ability to borrow, with a analyst from Deutsche Bank stating that he expected there to be ‘no impact on funding costs’. However, this upbeat response is usually the precursor to the next phase of the process – the rest of the oligopoly piling on the pressure – which seems to be confirmed by the S&P Senior Director of Financial Institutions Ratings, who recently stated that ‘there is a chance we could downgrade the big four banks’ – the likelihood of this happening is extraordinarily high, simply because of the dynamics of an oligopoly. However, there is an underlying sentiment to the ratings’ approach which is being accepted as normal, as something almost ‘natural’: the agencies are quick to point out that they fully expect the Australian State to bail-out the banks if necessary. Is this surprising? The answer to that for anyone who has looked at the business section of a newspaper during the last decade is a resounding ‘no’, but if we deduce the content of these new pieces we can see an extraordinary pattern emerging that consistently only has one loser – the public. One agency will pick up on public information – supporting Partnoy’s claim regarding the scant informational value these ratings hold – and actively downgrade the banks’ ratings; the banks will respond resolutely, but in doing so they attract the attention of the media and other agencies, and they imminently follow suit in downgrading the ratings; the State, having been pressured into becoming the safety net but in reality not wanting to become a lender-at-first-instance, plays down the prospect of ‘quantitative easing’ (bail-outs), which then provides the fuel for rating agencies to downgrade the banks further, which in turn forces the hand of the State to intervene to prevent a full-blown crisis. What happens in this game? The financial actors walk away scot-free, because this whole process is deemed to be part of economics, the rating agencies are somehow justified in their initial warnings because the crisis they prophesised happened, which in turn provides for reputational capital for the next time they turn their gaze towards a sector or region, which leaves just one party – the taxpaying citizen. In this game of ‘conscious complexity’, the public are the safety net which make the whole charade possible. The arrival of the oligopolistic stare in Australia spells bad news for the pockets of Australian taxpayers, but they are not the first to be affected by this organisational plague, and they will surely not be the last, which provides little consolation to the Australian public. Labels: Australia, Banking, Credit Rating Agencies, Rating Downgrades, Rating Oligopoly. Here in Financial Regulation Matters and across the U.K., with regards to those concerned with Corporate Governance, the collapse of the large retailer British Home Stores (BHS) has been a cause of great debate, and even greater consternation. The ease with which the company fell, and the sheer arrogance of those who caused it, led to Parliamentary investigations and a number of increasingly damning investigations from Journalists, academics, and commentators. In February, in one of the first posts here in Financial Regulation Matters, we looked at the calls to make private companies abide by the Financial Reporting Council’s Corporate Governance Code (which is aimed at Public Companies only), whilst later we also looked at the calls to enforce the implementation of workers and stakeholders’ interests at Board level, together with the proposed binding-quality of shareholder votes when it came to Executive compensation. If we take a look back into the archives of posts, a growing trend of shareholder activism, or perhaps shareholder responsibility, was beginning to form in parallel to the stated claims from the Government with regards to governance reforms. 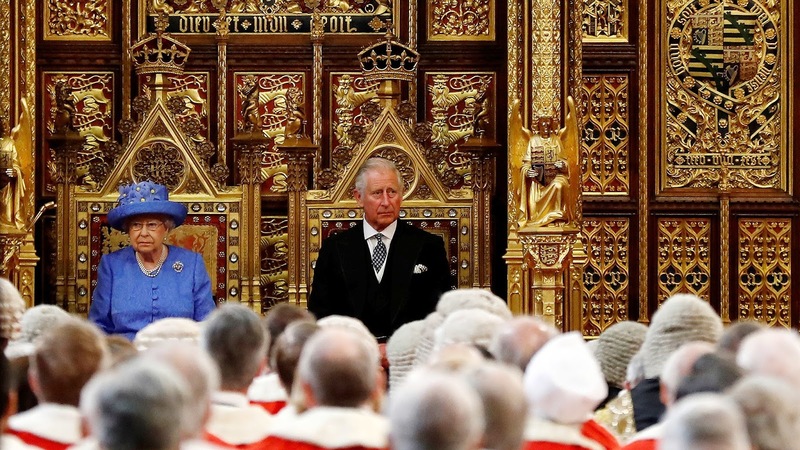 However, in the Queen’s Speech yesterday, a ceremonial event that marks out the legislative agenda of a given parliament, all of that momentum was brought to a screeching halt. In this post we shall therefore assess this development, why it happened, and what it ultimately means for governance reform. The momentum referenced above will not be covered here, as it is has been covered on multiple occasions in previous posts. However, the governmental incarnation of that momentum will be covered, as it provides for us an excellent example of a government paying lip-service in the wake of a massive failure – what we then have to do is examine whether a. the government had any appetite to enact such reforms in the first place, and b. what this method of retroactive insincerity means for the hope of protecting the public from further wrongdoing. In 2016, the Conservative Government laid out its apparent aims for corporate governance in the U.K. with its ‘Corporate Governance Reform Green Paper’, which began with a smiling Theresa May explaining to us that ‘for many ordinary working people – who work hard and have paid into the system all their lives – it’s not always clear that business is playing by the same rules as they are’. To counteract this the Government then pledges to set out ‘a new approach to strengthen big business through better corporate governance’, which would take the form of focusing upon ‘ensuring executive pay is properly aligned to long term performance, and raising the bar for governance standards in the largest privately held companies’. In demonstrating her neo-liberal philosophy, May continues by stating that ‘these are issues which are bout competitiveness, and creating the right conditions for investment, as much as they are issues about fairness’. Leaving aside this ludicrously patronising sentiment, and the pathetic denial of the devastating effect governance failures have upon people like the 11,000 who lost their pensions in the BHS scandal, the importance of the contents of these green paper make for extraordinary reading because, to all intents and purposes, it represents the attempt of Theresa May to bring her promises of protecting ‘ordinary people’ – the nuanced effect of the repeated use of this term is incredible - from the actions of ‘unscrupulous company bosses’ to reality. The green paper suggests that binding votes would enable shareholders ‘to hold executives to account for performance on an annual basis’, which it continues by suggesting that the development would also encourage increased shareholder engagement, which is argued is crucial to good corporate governance. A good start. The paper then goes on to discuss the ineffectiveness of ‘Long-Term Incentive Plans, and suggests that some incarnation of extending the period for Executives retaining share awards would help; it asks for more assistance from stakeholders and professionals/academics in this regard. So far so good. The paper then looks at the issue of employee and stakeholder engagement, and proposes a number of options, including creating ‘stakeholder advisory panels’, designating non-executive directors to be specified liaisons with employees and interest groups, and also appointing individual stakeholders on the Board. Promising! Yes, promising indeed, until yesterday when the focus on Brexit and backtracking on magnificently awful suggestions during the election campaign trumped corporate governance concerns entirely. In the media, a spokeswoman for the constantly title-changing Department for Business, Energy & Industrial Strategy (BEIS) stated that the Department was ‘still to respond’ to the Green Paper (when consultations concluded in February) and that they will outline their response ‘in the coming months’. 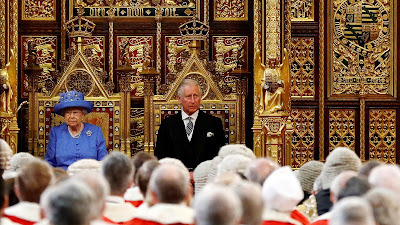 The fears that emanated before the Queen’s Speech have been justified, and quite rightly have caused a vociferous reaction, with the Trades Union Congress (TUC) arguing that ‘people are fed up with one corporate scandal after another and reform is long overdue’; the absolute absence of Corporate Governance reform in the Queen’s Speech means that, for the next couple of years at least, there will be little change to the regulatory framework in the U.K. Ultimately, there are a number of ramifications to this development. One is that it is clear that the electorate do not punish lip-service; this is not the first time that those in the Conservative Government (and if we are to be fair, nearly all political parties) have said one thing and then done another. Another aspect is that the regulatory framework will now not be altered until the Brexit negotiations have concluded, which is both a positive and negative: positively, it allows for the Government to react to the new environment with a newly enhanced framework; negatively, it allows for the Government to react to the new environment with a newly enhanced framework – the fears that the Government will turn the Country into a tax-haven can be realised by a new and more lenient regulatory framework. The absence of governance reform also demonstrates the belief of the political elite that ‘ordinary people’ do not understand or have the appetite to care about corporate governance, and they have thus focused on more politically visible issues like Brexit, and energy bills. However, this is a reality created by the political elite’s rhetoric, combined with the assistance of the mainstream media – in reality, people do care greatly about corporate governance and the effect it has on their employment, their pensions, and many other aspects; the reality is that affecting corporate governance reforms will reduce the profit and bonuses of big business, and this is simply not an option for the Conservative Government because, as Theresa May so nonchalantly declares, ‘the Government I lead will be unequivocally and unashamedly pro-business’ – perhaps this represents the other end of the scale to the notion of ‘ordinary’ that she so patronisingly refers to. Here in Financial Regulation Matters, we have discussed the Serious Fraud Office (SFO) on a number of occasions. Whilst this author has discussed the viability of the Office within a different regulatory framework, the most recent focus on the Office is arguably the most important issue with regards to the SFO. On the 18th of May we looked at the Conservative Party’s pledge to dissolve the SFO and merge it into the National Crime Agency, something which was suggested represented the culmination of Theresa May’s incessant quest to quash the SFO stemming from her time as Home Secretary. Whilst the general election result puts the Conservative Party’s pledges up in the air, somewhat, yesterday’s announcement – one which was eagerly awaited – shows that the SFO, and its Director David Green, will not be going down with a whimper… far from it. Yesterday morning, the SFO announced that it has charged Barclays and four individuals associated with the Bank – John Varley (former CEO), Roger Jenkins, Tom Kalaris, and Richard Boath – with ‘conspiracy to commit fraud and the provision of unlawful assistance’. So, in this post, we will look more closely at the decision to press charges, but also expand our lens to look at what this potentially unprecedented move means for the SFO, for the regulatory framework, and for creating a deterrent for financial transgressions moreover. As the Financial Crisis developed in 2007 and 2008, a number of banks faced the prospect of needing excess liquidity just to function, as was the nature of the so-called ‘credit crunch’. During this time, it was decided by British and American Treasury Officials that a program of ‘quantitative easing’ – more colloquially known as ‘bail-outs’ – was required and, as such, a number of banks accepted this taxpayer-backed liquidity for stakes in their organisations; we have discussed already how Lloyds Bank have just returned to the private sector after nearly a decade of public ownership (in part), whilst RBS represents the other end of the scale entirely. Yet, one notable bank refused the public investment and instead sought a private capital injection to survive the financial storm. 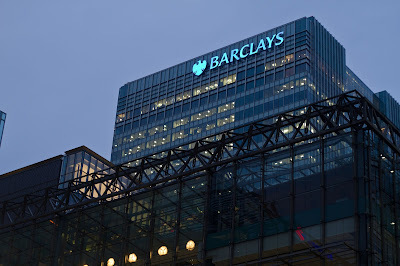 In June 2008, Barclays turned to the Qatar Investment Authority for investment and, in conjunction with a number of other investors the Bank raised £4.5 billion to stave off the negative financial environment at that time. Yet, the original narrative was that the bank had just chosen to remain private and the Qataris had invested legitimately in a massive British banking institution, but this apparently was not the case at all. The SFO has nailed it colours to the mast by alleging that the bank and the investors were engaged in side-deals whose details were not made public, with the actualities being that at the same time the Bank received the investment from the Qatari investment vehicles, the bank promised to pay the investors £322 million in the shape of advisory services for ‘helping to develop business in the Gulf’, as well as providing a $3 billion load facility to the State of Qatar. The Financial Conduct Authority is conducting a parallel investigation into improper disclosure, but is awaiting the development of this much more serious case before proceeding, which underlines the seriousness of the SFO’s approach. This seriousness, and also the special nature of the developments, is perhaps better signified in numbers: John Varley faces a maximum of 22 years in Prison for his crimes, whilst the other defendants each face a maximum of 10 years in Prison, on top of a fine for the Company. Understandably, this action which essentially marks the only criminal investigation and charge relating to the Financial Crisis (institutionally speaking at least – lest we forget Kareem Serageldin) is sparking plenty of debate. One analyst confidently stated that he does not expect the bank to ‘seriously penalised… for the sins of the preceding regime’, whilst one commentator argues alternatively saying that to focus on the timing of the crime, and the fact that the bank avoiding receiving taxpayer money, ‘misses the point’, with the ‘point’ being that SFO must prosecute on the evidence it sees. What is becoming a general theme however is the impressive courage being displayed by the SFO, with a Partner at Irwin Mitchell stating ‘taking on Barclays… sends a very strong message that the SFO is now fearless in terms of the companies and individuals it pursues’. This theme is similar to the one advanced here in Financial Regulation Matters months earlier: the SFO is steadily demonstrating that it has the capacity to stand up for justice in this transgressive arena and make moves which many regulatory bodies would steer clear from, for a number of negative reasons like the ‘revolving door’ theory. However, this praise that the SFO is garnering is consistently overshadowed by Theresa May’s crusade against it so, widening our lens ever so slightly, what does this dynamic demonstrate. Theresa May was emboldened as she stood in front of Number 10 Downing Street, confidently calling the snap election. The accepted understanding was that the Conservative Party were so far ahead in the polls, and ahead of a Labour Party in disarray, that their leader could begin to really aim for her desired policies. It was in this confident mode that the Prime Minister made it clear that this non-ministerial department, one which had only recently made quite an impact with its investigations into Rolls Royce and Tesco, was not doing well enough and needed to be subsumed into the National Crime Agency. What this demonstrates is the sentiment behind Theresa May’s leadership and the Conservative Party she leads: it is not about National Interest, but curtailing efforts to apply the law and general rules evenly. The SFO is actually leading the charge against fraud, something which the U.K. is beginning to lead the world with in terms fraud within its borders, and as a result of that the Prime Minister wants to shut it down – the equation is simple and clear to see. Yet, these intimidatory tactics have, thankfully, failed. Whilst there is a real possibility that even with a conviction no one will go to Prison, the sentiment and constitution not to be bullied by those who champion private interests against the interests of the public, are to be praised. In April this author stated that the SFO could be the spearhead of a new regulatory framework, and the more it continues to pursue those who believe they are above the law, the more that proposition proves all the more sensible. If Theresa May does not survive the political cauldron she is currently inheriting, then the next leader of the Country must give the SFO more funds, not reduce it. It must give the SFO more than £30 or £40 million a year, because doing so sends an incredible message: there are people willing to uncover and punish fraudulent behaviour, and they have the resources with which to do so – the sooner that situation becomes reality and we move away from this private-interests-first narrative that is wreaking havoc in all walks of life, the better society will be. Today’s post looks at the issue developing in the corporate world concerning multiple Chairmanships, particularly with regard to leading companies. Following on from investor unrest regarding the positions held by the Chairman of Tesco, which will be discussed in this post, recent investor action against the positions held by Renault-Nissan Chief Carlos Ghosn is keeping this issue in the headlines. So, in order to make sense out of this we will examine the two stories and look at how reasonable it is for one person to hold multiple Chairmanships; with the recent and relative rise of shareholder activism, it is likely that this issue will continue to arise. Before we look at the issues within the French car manufacturer, we need to revisit someone who we have discussed before here in Financial Regulation Matters, and that is the Chairman of Tesco, John Allan. Rather than focus on his comments regarding gender equality, as we have already done, the turn of the year represents a great example of the problem at hand here. In September last year, Allan had to take action so as not to become ‘the U.K.’s only triple chairman of FTSE 100 companies’. In removing himself from the role of chairman and taking up the position of non-executive director in the payments group Worldpay, Allan had sought to pre-empt what ‘might well be a negative reaction to somebody attempting to be the Chairman of three FTSE 100 companies’, although he does remain as the chairman of London First, a business lobby group, albeit non-FTSE 100. However, this pre-emptive movement to avoid being a triple-chairman has not stopped investors at Tesco focusing on his other Chairmanship, namely that of Barratt Developments, a leading property builder. A number of institutional investors in Tesco are alleging that as Chairman of such an expansive company like Tesco, Allan should be ‘devoting considerable time to the role’ which, through a proposed opposition to Allan’s reappointment as Chairman, the investor group notes is ‘considered to be crucial to good governance’. The group make the point, rather emphatically, that a Chairman must be present and devoted as they are, ideologically speaking, ‘responsible for the culture of the board’ and that without that leadership the board may be, at best, inefficient and, at worst, negligent or transgressive. The source of that fear is obviously the recent accounting scandal at Tesco, but the notion of Director responsibility is a truly important one when considering what ‘governance’ actually is, and also how best to achieve it – although different in nature, the situation on the other side of the Channel also brings this issue into focus. Earlier this month, the French financial markets regulator, the Autorité des Marchés Financiers (AMF), received a 24-page letter from three shareholder activist groups requesting for Renault-Nissan to be put under review for potential conflicts of interest at Board level, and also possible governance breaches. 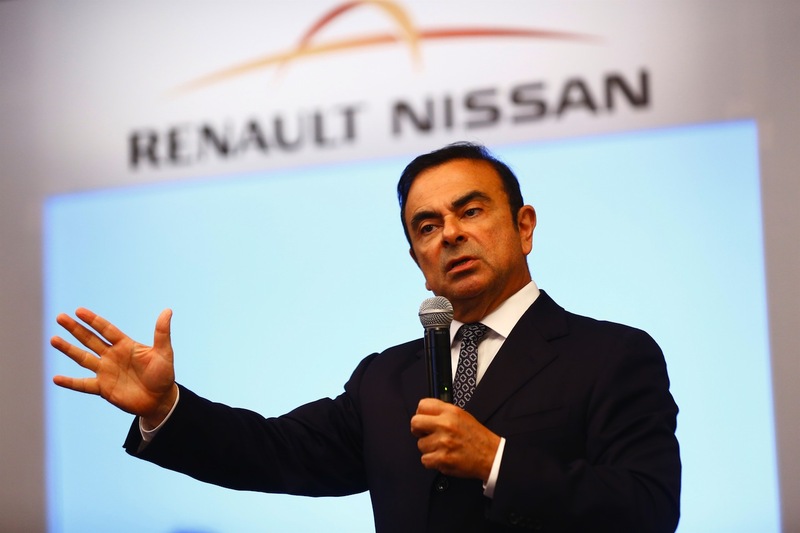 The main target of the request, the embattled Renault CEO and Chairman Carlos Ghosn, is also currently the Chairman of Mitsubishi and Chairman of Nissan – he was also the CEO of Nissan up until last year – which amounts to an incredible workload leading these sector-leading companies. Although there are suggestions Ghosn is preparing his successor so as to facilitate the cohesion between the companies when he steps down, this has not stopped investor groups seeking investigation into the workings of the Board at Renault. Demonstrating their motive as institutional investors, the group of three state that ‘we believe an investigation is urgently needed to uphold the rights of Renault shareholders’, with the main focus being on the ‘creeping transfer of powers’ to a Dutch-listed joint venture between Renault and Nissan which, according to the three investor groups, has resulted in a reduction in ‘adequate governance mechanisms or protections for Renault shareholders’. Though the AMF have refused to comment so far, the recent tension between the then-Finance Minister Emmanuel Macron and Ghosn – as the French Government owns a 20% stake in the company – potentially indicates a rough ride for Ghosn now that Macron is President. Ultimately, the role of the Chairman is coming into view more and more, and this is a positive element. It is a positive element because it is important that we seek to ask some serious questions if we are to achieve good governance more generally. In order to provide for some sort of societal balance, a number of actors must fulfil their roles adequately and, in terms of the business arena, it seems as if though institutional investors are finally stepping up to the plate, as we have already discussed here in Financial Regulation Matters. In order for big business to behave in a sustainable and socially-considerate manner, the culture that begets that ideal must be set at the very top – in light of that, how likely is that to happen if the Chairman is concurrently running two, three, or even more companies at the same time? Whilst institutional investors will call for capped Chairmanships to protect their own position, as is their right, the enforcement of capped Chairmanships would likely have a positive societal effect also. It is important that the leading supermarket is controlled with complete focus given its centrality to a given society, and it is vital that one of the leading manufacturers of cars is controlled with complete focus, particularly given the environmental impact of failings in this area i.e. Volkswagen’s infamous struggles in this area. Hopefully, the investors increase the pressure they are putting these large companies under to force regulators to take action, because without that pressure only scandal can affect change, which is a particularly negative dynamic. Moody’s Upgrades RBS: An Indicator of the U.S. Department of Justice’s Forthcoming Decision? In this post, the focus will be on the recent decision by Moody’s to upgrade RBS’ credit rating, citing their ability to withstand future penalties for financial crisis-era transgressions. With RBS having been covered on a number of occasions here in Financial Regulation Matters, this post will take a different view of the Bank and look at the pending future it has. The question stemming from the recent upgrade is whether it indicates that the settlement with the U.S. Department of Justice (DoJ) will be as the bank expects, which is what Moody’s believe, or whether it will be much more, with the likely result being an incredible blow to the Bank’s attempted recovery. RBS was central in the Financial Crisis, and this is confirmed by the number of penalties and settlements it is facing. There were arguably three remaining hurdles in this sense up until recently (it has already faced and paid a number of fines since the Crisis), with one of those hurdles falling by way of the agreed settlement with investors who were fraudulently led into investing in the Bank in 2008. Yet, it seems as if the 82p per share paid to those investors will pale in comparison with what is coming. Only last week was it reported that the Bank is in advanced settlement talks with the Federal Housing Finance Agency in the U.S., which is concerned with the mis-selling of mortgages to Fannie Mae and Freddie Mac. The news report suggests that the settlement will be around $4.5 billion, although there are fears that this could be much higher. 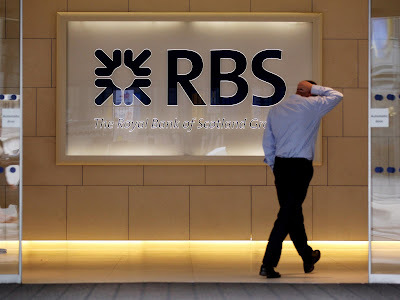 Yet, the biggest penalty on the horizon comes from the DoJ, with reports suggesting that RBS investors would actually be happy if the fine was around $10 billion, which would suggest the penalty will be much higher; it has been suggested that the Bank has put aside around $6 billion for future penalties, but the fears surrounding the DoJ’s decision, together with its recent punishment of Deutsche Bank for just over $7 billion, could lead one to suggest that $6 billion may not be enough, given how entrenched RBS were in the scandal. However, all of this uncertainty, something which is massively frowned upon in the capital markets, has not stopped Moody’s from increasing the Bank’s rating. With regards to the rating agency’s assessment of the bank’s long-term creditworthiness, the agency has increased the rating to Baa3 – its lowest investment grade – stating that the increase reflected the bank’s ‘strong capital and litigation reserves levels’. The agency also suggested that the bank now has ‘sustainable earnings from core retail and corporate businesses’ which would offset any pressure emanating from Brexit. It should come as no surprise that the Bank is overjoyed with this new rating, but there are a number of factors which would suggest that the rating is, perhaps, premature. Whilst there are educated guesses as to the amount that will be owed after settling with two of the U.S. agencies pursuing the bank, it is difficult to state with any certainty whether the DoJ will agree with the $10 billion being quoted beforehand. Also, as reported recently, the Bank is still facing up to thirty other penalties and settlements, with just one being the ramifications of the now defunct ‘Global Restructuring Group’, for which the bank has, reportedly, already set aside £400 million to cover those costs. With all this in mind, it is difficult to say with any certainty whether the bank is currently ‘investable’. Ultimately, this current gap in between the rating assessment and the revealing of future events is the raison d’être of the rating agencies. Yet, as we have spoken about on a number of occasions, the rating agencies have suffered great damage to their reputation so it will be interesting to see whether investors pay attention to this particular rating change; usually, investors will, but the difference here is that the future facing RBS is particularly bleak – will investors trust their money to the ‘opinion’ of a rating agency irrespective of the mounting evidence that says RBS is far from the edge of the woods? However, Moody’s rating could indicate the opposite – it may be the case that the agency has reason to be confident that the DoJ will go easy on RBS, which will be good for the bank but negative in terms of establishing effective deterrents. In related news, the DoJ is slightly behind with regards to RBS, as the dismissal of Attorney General Sally Yates in January, followed by the appointment of Jeff Sessions, resulted in a delay in proceedings, whilst further amendments to the way in which settlements are distributed – Obama championed distributing settlement proceeds amongst victims and also community groups, whilst Trump favours distributing them amongst victims only – are also holding the RBS case up. In that sense there is a potential that RBS will profit greatly from the Trump Administration and the re-establishment of neo-liberalism in America which, when we consider just how central RBS were and how they have continued to transgress after the Crisis, would be a really depressing reality to bear witness to; hopefully, the DoJ makes an example out of RBS, although the best example would be to put the leading members of the 2007/8 RBS board on trial. It is likely the other end of that scale will be seen, however. Labels: Credit Rating, Financial Crisis, Moody's, RBS, Trump, US Department of Justice. This post reacts to the news yesterday that the E.U. is developing plans to house the massive €1.2 trillion ‘clearing’ market wholly within its jurisdiction post-Brexit, putting the City of London’s position as leader in this market in great peril. In this post we will review the obviously formidable response – including citing global systemic risk – but we shall also look at the underlying tone of the E.U.’s attempted move and what, in reality, it means for Britain as it heads, tepidly, into its negotiations with the E.U. over the terms of its secession – it seems the ‘freedom’ that was promised can only be achieved at the same time as experiencing remarkable loss and, assuming that “Leave” voters want to continue experiencing the trappings that come with a prosperous nation, everything will pretty much stay the same as before, except for one crucial difference. In terms of the actual substance to yesterday’s news, it is prudent to start off with a basic understanding of what ‘clearing’ actually means, and also the size and importance of the clearance market in the European context. Broadly speaking, ‘clearing’ in the financial sense relates to the usage of a ‘central counterparty (CCP) to eliminate risks associated with the default of a trading counterparty’, with a more specific definition being ‘a third party organisation [that] acts as the middleman for both buyer and seller of financial contracts tied to the underlying value of a share, index, currency, or bond’. In terms of the third party cited above, London – and more specifically, the London Clearing House – is a major player in this field, clearing two-thirds of the euro-dominated contracts every day, totalling €927 billion’s worth; incidentally, this pales in comparison to its daily clearing of $2.1 trillion. It is for this obvious reason that the current proposals being advanced by the E.U., namely that the European Securities and Markets Authority (ESMA) should play a much more significant role in the regulation of clearing houses, is causing such consternation. Although the proposals (advanced as part of the E.U.’s Capital Markets Union Strategy) have stopped short of recommending general location requirements which would, in the words of the Commission, be a last resort, it has heightened the fears for the British in light of the upcoming secession. With the underlying threat being that a so-called ‘hard-Brexit’ would not allow operations in London to be regulated by ESMA, resulting in relocation to France or Germany, British financial professionals have been quick to state the importance of the capacity of London when considering such moves. The London Stock Exchange (LSE), who own the London Clearing House, stated that it supported ‘enhanced regulatory supervisory cooperation’, but that a change in location would ‘increase, not decrease, risk and costs for customers’. The Policy Chairman at the City of London Corporation, Catherine McGuinness, additionally stated that ‘fragmentation’ of foreign exchange and interest trading could see costs rise by ‘as much as 20%’, which the LSE has recently claimed would work out to $77 billion for banks alone. Yet, this doomsday-like response is not being shared on the continent, with Deutsche Boerse – the German equivalent of the LSE whose proposed merger with the LSE broke down earlier this year on anti-competition grounds (most likely for reasons like this issue today) – stating that the impact will be between $3 and $9 billion. Whilst the ‘nuclear option’ of relocation is being declared as unlikely, and the E.U. is maintaining that they are simply bringing their supervision standards in line with the U.S. standards, the news represents a dichotomy that is revealing. The manoeuvrings in Brussels represents two things, arguably, for the British. The suggestion of relocation reminds the British that Brexit negotiations will be on European terms, and not British terms. However, it also serves as a dose of realism to the British and to any other member thinking of leaving – in order to have access to the benefits of the E.U., one must abide by European rules and regulations… there is no other option. In reality, a member leaving the bloc will, having been integrated into its system and used to its benefits, have no choice but to abide by the rules, with the only difference being that the right to do so will cost more. 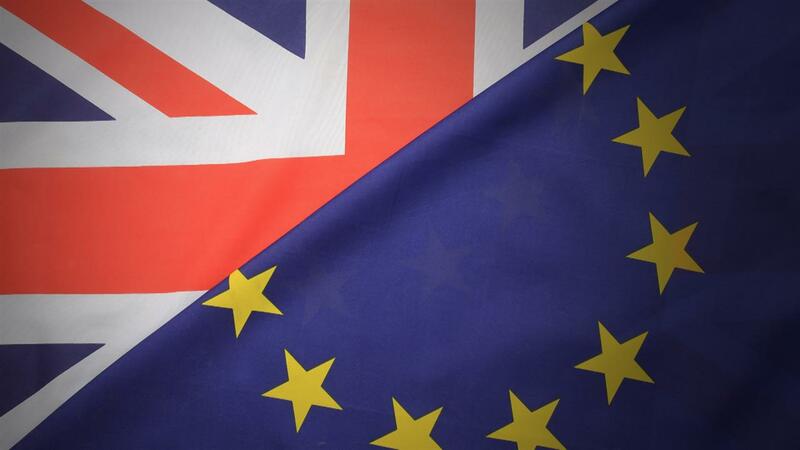 The posturing by the E.U., which is being supported by private institutions by way of pre-emptive relocations, is no doubt a signal to the British negotiating contingent that a ‘hard-Brexit’ will be a painful-Brexit. Of course, it is the right of the bloc to do this and, arguably, it must do this so as to serve as a deterrent to other members – members of a bloc must feel that their future is better in the bloc rather than outside of the bloc, this should be obvious – but, in terms of the British who voted “leave” in June 2016, it will surely start to dawn on them that the claims sold by the Brexiteers were simply unobtainable (which is probably why the Conservative Party lost their majority in the last election). The £350 million a week that will be reinvested in the NHS, Supremacy of British Law, cuts to immigration, border controls, and the host of other claims advanced by the ‘leave’ campaigners are, in reality, being proven to be nothing more than empty rhetoric. Today’s news, as just one example, demonstrates that in reality the British people will be exposed the very same European Union that they voted to leave, but it will cost them more for the privilege – it seems the dismissal of recognised referenda theory – that there should be two referenda, spaced years apart - will have lasting effects. Today’s post looks at the recent news that, according to the Financial Ombudsmen Service in the U.K., complaints over the last year regarding so-called ‘payday loan’ companies have increased by an incredible 227%, whilst complaints relating to consumer credit more broadly have increased by almost 90% to around 26,000. We have looked at this issue before here in Financial Regulation Matters on a number of occasions – most notably with regard to the Financial Exclusion Committee – so today we will assess these increases and the supposed rationale for them. However, as is usually the case when we look closer at any issue, there is a growing underlying issue which is intensifying at every turn. The figures released by the Financial Ombudsman Service relate to most sources of credit, with the majority of complaints still being concerned with Payment Protection Insurance. Whilst some areas for complaint in relation to credit went down – complaints about banks for example – the general rise in relation to personal credit has been described as ‘striking’ by the CEO of the Financial Ombudsman Service, which follows on from the warning from the Bank of England earlier this year on the rapid expansion of personal credit in the marketplace. It has been suggested that one of the reasons for such a rapid increase is the availability of credit now, in conjunction with the increased knowledge of consumer rights, although this has been countered by attempting to understand the wider issues. Writing in The Independent, one commentator notes how ‘increases in the cost of essentials such as children’s clothing, and food, have started to play an important role in the inflation figures’, which he then continues to state that ‘if you’re struggling, if it’s a choice between a high-interest loan and not feeding your kids, what are you going to do?’. The picture painted by the commentator is bleak, but we must examine it to see if it holds up. It would be accepted to believe that the very poorest in society experience these circumstances, but that would be to operate within pre-2007 parameters; the reality is that since the Financial Crisis and the attack of austerity measures, the dynamic has changed dramatically. If we focus on the ‘just about managing families’, as Theresa May labels them almost continuously, then the reality of the blight that is payday loan companies really comes into focus. This category, which according to the policy thinktank that spawned the phrase describes as ‘lower middles class and upper working class families, around half of all households in Britain’, is repeatedly turning to payday loan companies, or even just high-interest loans, to maintain their existence – in reality, the category is better defined as 6 to 7 million families with ‘below average’ incomes. Nevertheless, the figures, and the response by leading politicians, make for astounding reading. There are more than 13 million people in the U.K. ‘living in poverty’, 7 million of which are from working families as stated above, whilst the Joseph Rowntree Foundation found that ‘if the costs of disability are taken into account, half of those in poverty are either disabled or living with a disabled person’. There, quite obviously, are a variety of factors that will affect a person’s financial standing, with high and increasingly insecure private rentals playing a part, just as much as the ‘squeeze’ on those raising young children. Yet, some of the policies emanating from Theresa May’s Government seem intent on making it harder for these families, not easier as she was at pains to pledge during her disastrous election campaign. 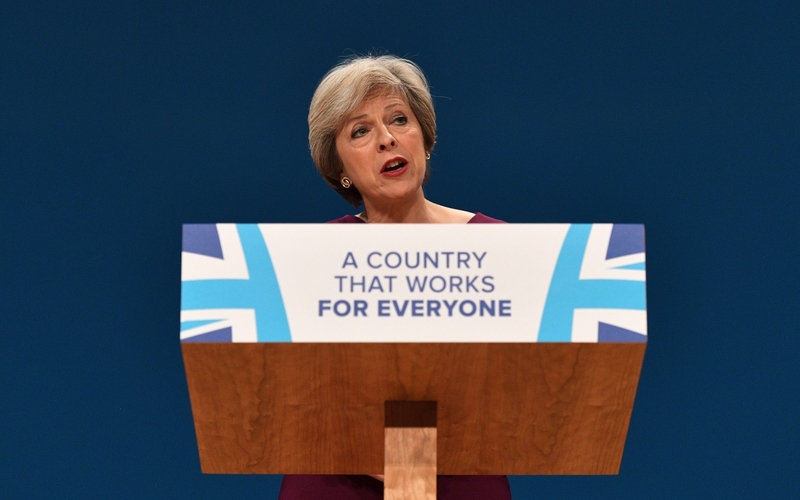 The Conservative Manifesto contained a pledge to remove the ability to eat a free school lunch from over 900,000 children, a move which the Education Policy Institute confirmed would affect children coming from ‘ordinary working families’. This came after the move to end universal free school lunches for infants – replacing them with free breakfasts instead – which will cost the families of those affected £440 per child per year and save the Government £650 million per year, a move which ‘risks punishing exactly the kind of families the prime minister has promised to help’. This post has chosen the subject of ‘children’ as its focus, but in reality it could be anything – mental health, disability, discrimination – society is being torn apart by the incessant quest to have the country pay for the actions of the elite during the turn of the century. Reports like that of the Institute for Fiscal Studies, that May’s welfare cuts will push ‘almost one million more children into relative poverty by 2022 and two thirds of those affected will live in working households’, do not seem to stemming the tide. The connection between looking at young families and payday loans is worthwhile because, as the commentator implied earlier – people will turn to high-interest lenders when it comes to caring for their children. The policies of this government are concertedly putting these ‘just about managing families’ into that predicament, which is likely the underlying reason for the Conservative Party failing to win a majority in the recent election – the recent statement by the Prime Minister’s new Chief of Staff, Gavin Barwell, that the Party has to look at ‘ending austerity’, is a clear indicator that the well is beginning to dry up. When it comes to denying children free lunches at infant schools, it is clear that there is nowhere left for the Government to go in their mission to have the country pay for the costs of the few. As has been repeated before here in Financial Regulation Matters, the focus is on the Conservative Party because they are in power and their actions must be scrutinised, but when Children are potentially going hungry whilst in a place of mandated education, enough is surely enough. The suggestion by the Financial Conduct Authority, that the cap on charges by payday loan companies – which has seen their numbers reduce – should be lifted so as to avoid ‘illegal lending’, however, suggests that the powers that be do not agree that is enough is enough, which is an incredible thought when one looks at the ferociousness of this assault that is labelled as ‘austerity’; who else can be disadvantaged in its name?